We are told to slather on sunscreen like its our job, but nobody ever mentions your lips. Truth be told, if I don’t wear sunscreen on my lips guaranteed I get a nasty sun blister spot within days. I’ve used many products over the years, those with color and those without, those with SPF 10 to SPF a million. Overall I prefer SPF 20-25, any more is just overkill and I like it clear, no tint or I’m verging on College Spring Break Beauty norms (i.e. super glossy gloopy lips), which is not that attractive once your over 21. 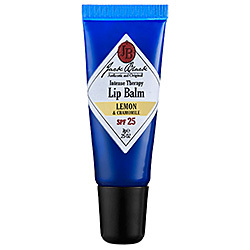 The only one I have found that meets all of my criteria is Jack Black Intense Lip Therapy. SPF 25, check. Non-tinted check. And bonus it tastes like a lemon tart. Whenever I make sure I use this there are no sun blisters to be found. It works. Although I don’t use this everyday, I always have it on hand in the summer for the beach, sailing, or any other intense sun activity I find myself engaging in and in the winter if I actually went snowboarding, I would bring it along there too. Basically, don’t forget about your lips, they burn too. ← Its F-ing Winter and nothing can save you, except maybe for this.